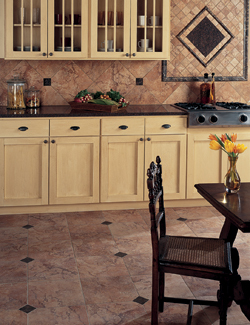 Take advantage of our array of durable vinyl flooring in Pittsburg, PA, to improve your home. Our local store offers a wide selection of vinyl sheet flooring, vinyl tile flooring, and vinyl plank flooring in a variety of colors and styles. Each vinyl option stands up to years of daily wear and tear while still maintaining a fashionable appearance. Vinyl flooring is now more popular than ever thanks to updates in manufacturing technology. You can get the look of hardwood, stone, and ceramic tile floors without paying the high price tag or worrying about the same level of maintenance. No matter what your home décor style may be, we have the right flooring option in stock for you. Rest assured that when you choose our company, you will receive the best service available. From the initial shopping experience in our beautiful showroom to the final details of your vinyl flooring installation service, our dedication to quality and professionalism sets everything we do apart. Our flooring specialists make it a priority to match you with the right vinyl flooring option, while our installation technicians securely integrate your new flooring with precision to ensure it lasts for years to come. Enjoy the long-lasting performance of vinyl flooring while still giving your home that timeless look you’ve always wanted. Thanks to innovative embossing and other design advancements, vinyl tile flooring makes for the perfect, convincing alternative to stone and ceramic tile. Its affordable pricing makes it a great addition to any home improvement budget as well. Regular sweeping and occasional mopping is all that’s needed to keep your vinyl looking great. Otherwise, this product needs little to stand up against daily foot traffic, spills, and blunt force of dropped items. There’s no need to worry about scheduled sealing or other forms of maintenance as you would with tile. Rely on the professionals to install your new vinyl sheet flooring. Skilled in a variety of installation practices for different kinds of flooring, our technicians are qualified to handle any flooring improvement project. It is important to note that vinyl floors are also one of the easiest flooring types to integrate into your home, meaning you don’t have to worry about issues with the materials integrity. Because of this ease of installation, the overall cost for adding vinyl to your home is less than other options. In addition, vinyl flooring now features a padded layer underneath that is kept securely in place after installation. This makes walking and standing on it far more comfortable than it used to be decades ago. Want to add the warm look of hardwood flooring to your home but are worried about the maintenance? Concerned your children or pets might damage such a costly flooring investment? Put your fears to rest and visit our showroom to review our many vinyl plank options. Just like vinyl sheet and tile flooring, vinyl plank flooring has become popular for its stylish look as well as its unparalleled durability and comfort. Find the flooring of your dreams in our store’s luxury vinyl tile department. Contact our store in Pittsburgh, Pennsylvania, to learn more about our flooring selection and installation services.